America and Canada both have issues to discuss about what enters their country from the other. It’s telling that Canada’s highest concern is unwanted weapons and America’s is unwanted people. I Saw DOOM this weekend. How to recover from Mac OS 10.4 E-Mail problems. In Mac OS 10.3 all the messages for each inbox was stored in one file with a .MBOX ending. These files could be backed up and swapped when Mail.app (The geeky name for Apple’s Mail program) wasn’t running. This made creating backups and restoring them very easy. The most compelling reason to use Mail.app is it’s search features, and in OS 10.4 these features have been expanded, however, to allow for the individual indexing and searching of E-Mails via Spotlight Apple spilt those big .MBOX files into individual .emlx files. So far Apple has not provided any means to import or recover these files, only to import the .MBOX standard that many other mail clients use, including the old version of Mail.app from OS 10.3 and before. These are the steps I went through to recover my mail after I accidentally allowed a filter to delete all my mail. This might also help for people who use POP E-Mail accounts and had their computer stolen or lost a hard-drive. For most accounts I use IMAP mail boxes, but if you delete the E-Mails on the server IMAP’s ability to keep all your mail clients in sync is lost (and you look like an idiot). Step 1: Have a backup. I know that cuts a lot of you out right now, but I’m sure it’s not the first time you’ve been told to backup your files. (Future entries will cover how to backup your files.) If you don’t have a backup of your Mail files you might be able to make a copy of ~/Library/Mail and work from there (~ stands for your home folder). My new Acura 1.7 EL is all mine! 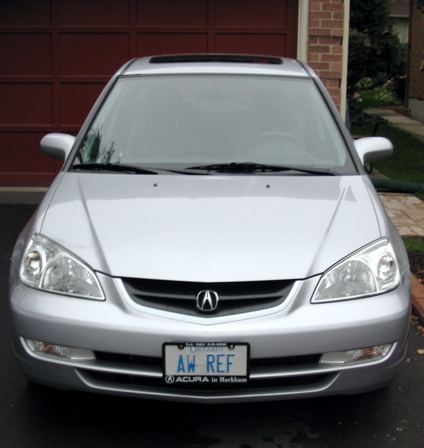 After my 1997 saturn with 199,450KM on it developed serious slipping issues with it’s automatic transmission I traded it in for $3000 because the Acura dealer didn’t test drive it! Oh happy day! Apple is getting everyone excited abou their Oct 12 event (Apple stirs product speculation over Oct 12 event, Washington Post). Given that I was right about the G5 PowerBook never coming I’m going to speculate on this one too, we’ll see how I do. The ‘One more thing’ will be a second core on the G4 PowerBooks. The core of a chip is the part of the chip that does the thinking and the rest (the die, etc.) are the parts that get all the information in and out of it. Others are predicting a video iPod, but that’s my guess. We’ll see next week. For now the best article is over at PC World, Hey, Let’s Speculate Idly on Apple’s Next Announcement! UPDATE: OK, so I was wrong, but I gave it a try. It should be interesting though, now that Apple is getting ABC TV content into the iTunes music store it should be interesting to see what happens next. You are currently browsing the iMatt :: The Blog of Matt Clare weblog archives for October, 2005 .